Earlier this year I was very pleasantly surprised to find out that the classic space fantasy toys Galaxy Laser Team had been reissued and put back on the market by an online retailer called VictoryBuy. It seems that project worked out well, because now a variety of other old Tim Mee/Processed Plastic toys have been made available again. Pretty awesome, huh? The two new reissues that caught my interest the most were the Cavemen, which come 48 to a bag, and the 15" tall Battle Mountain. I was able to get a hold of both and was anxious to share my thoughts on these nostalgic goodies. When I was a kid I almost exclusively collected monster toys. I had little use for toy soldiers or cars, but if it had tentacles, three eyes or any other monstrous features, I'd be down. Even though they weren't monsters, for some reason I'd usually let cavemen figures take part in my monster toy battles. I guess you just can't go wrong with brutish dudes wielding clubs, axes and boulders. I don't think I ever had any of the caveman figures that were produced by Tim Mee/Processed Plastic in the '70s and '80s, though. But now, thanks to the reissue, I've got 48 of the buggers. 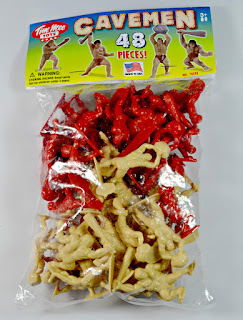 An entire tribe of little plastic cavemen! 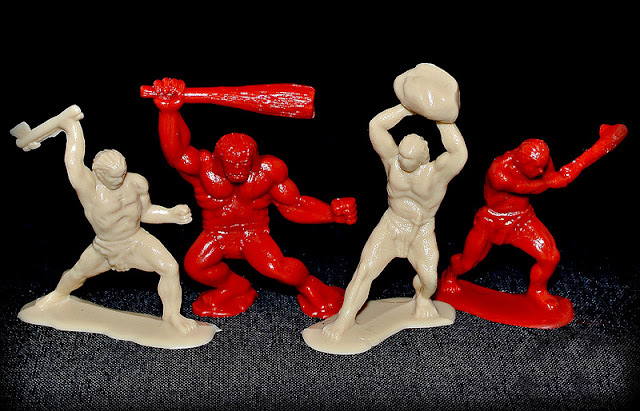 I'm not sure what colors the Processed Plastic cavemen were originally issued in, but these new ones come in red and beige and are made of a hard, light plastic comparable to that of the Galaxy Laser Team figures. There are four different sculpts, in one bag of 48 you get plenty of each sculpt in each color. My personal favorite is the hulking neanderthal waving a big club over his head. Back in the days when it was still OK for kids to think cavemen battling dinosaurs could have totally happened, this guy would have been most ready to take on the plastic T-Rex. The other three guys are a bit less badass and less detailed, but are still pretty cool and help fill out any plastic prehistoric battle nicely. Speaking of plastic prehistoric battles, another new Tim Mee reissue provides the perfect setting for one. I'm talking about the Battle Mountain! 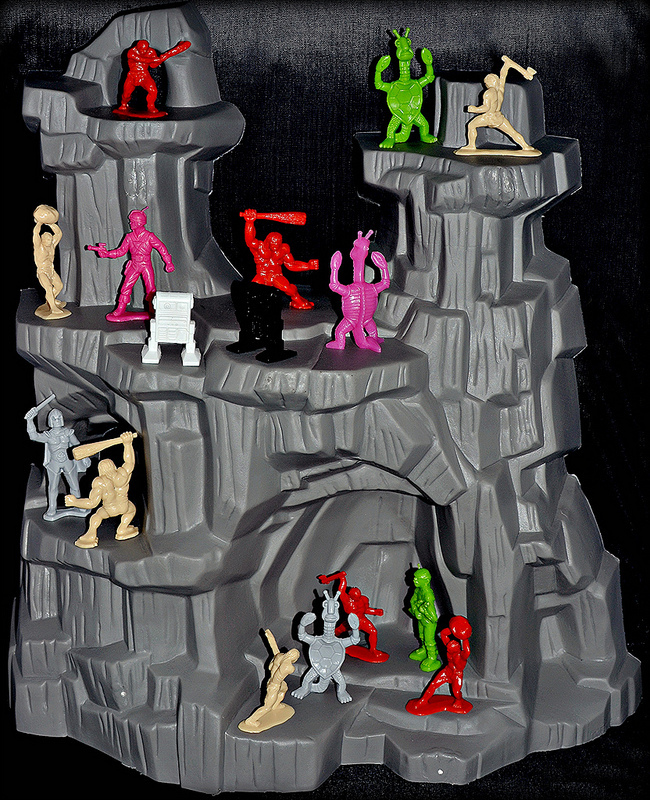 The Battle Mountain is another toy I was unaware of in its original form, so I can't compare it to its new version (although I'd imagine there's little different from old to new). But basically, it's a 15" tall gray plastic cavernous environment that you can use with your Tim Mee mini figures, or pretty much any other kind of figures. 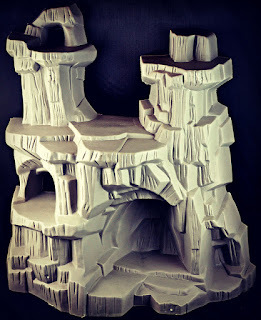 Having had both the Monster in My Pocket and Mighty Max mountain accessories as a kid, and remembering building monster-infested castles out of blocks in those days too, the Battle Mountain brings back great memories. I would spend hours positioning all my monster figures around the castles/mountains, only to knock them down and do it all over again day after day. The Tim Mee Battle Mountain would be a perfect place for any monster battle. I'm not sure how many of today's kids would spend a long time doing this, but a couple of decades later I totally still would (and totally did, when I was taking photos of the Mountain for this post). The Battle Mountain is a nice size at 15" tall--not too big to store easily but big enough that you can fit quite a few figures in it. I like the fact that the back of it is flat and hollow, because it also helps with storage. The sculpt of the Mountain is pretty cool and has some good detail, including some cave areas and various plateaus where you can place figures. In addition to displaying figures or staging battles, I think this would be a great item to have for anyone who likes taking photos of small toys. I am always looking for good settings for photos of mini figures, so I'm sure I'll be getting a lot of use out of the Battle Mountain for that purpose. I think it's very cool that these old toys are being kept alive for kids and adults alike, and the Cavemen and Battle Mountain are very welcome additions to the Tim Mee reissue collection. If you'd like to stage proper caveman battles of your own, you can pick them up through Amazon at the below links. Get the Cavemen reissues here. Get the Battle Mountain reissue here. Nice write up. I had no idea this toy had been reissued. I have an older one that's exactly the same but 'brown'. It was previously issued (presumably by a different company) with animals rather than soldiers though as you say, it works with numerous types of figures. Thanks! Interesting. Yeah, I'm thinking it was released in a few different ways over the years. The battle mountain was the centerpiece of several different boxed sets that Processed Plastic (Tim Mee's parent company) produced starting around 1991. It came with Army Men, Dinosaurs, Jungle Animals, and even the Galaxy Laser Team Space figures. It also came in different colors including light gray, brown, and red. Some of the original mountains had 2 inexplicable tabs at the bottom. There might have been a base at some stage that was eliminated, but that's just conjecture. The tabs were trimmed off the reissues so the mountain stands level. Processed Plastic was sold in 2005 and the reissues are manufactured by the new owner using the original molds, but in a different factory. Hey Jeff--thanks for the info and for bringing these cool toys back to the market! Huh. My brother & I had a dinosaurs vs cavemen set which also came with a mountain that was sort of similar to this one, except it was in three pieces (one large mountain very like this one with multiple caves, a rock bridge that fit onto the right-hand summit of the big mountain, and a smaller mountain with just one summit that the bridge led to). It was grey plastic and had much 'softer' cornders and edges than this, but the cave openings had a similar configuration. forgot about the rope bridge. mikemonaco's set sounds like an MPC mountain. Marx made them as well; they are pretty pricey when you find them complete; the Tim Mee Battle Mountain is the basis for my WAR THAT TIME FORGOT and TUROK SON OF STONE playsets. I bought two at AMAZON!